The hCalendar Microformat is closest in terms of usage and, arguably, usefulness to hCard. Just as you may like to keep your contactsâ€™ details up to date and synchronized between your various devices (phone, PDA, and your desktop or laptop computer) and online services (web-based email, contact and calendar services, and so on), you probably feel the same way about calendar events. As with hCard, thereâ€™s an existing standard for calendar events, namely the IETF iCalendar standard. This standard underpins calendar applications such as Google Calendar, Lotus Notes, and Appleâ€™s iCal, to name but a few. If you were to save one of these events from your calendar application and view it in a text editor, youâ€™d see the data marked up quite clearly. Letâ€™s see this in action. 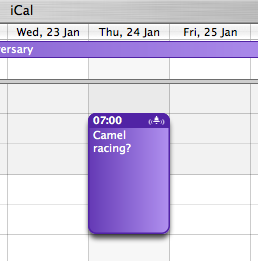 I have a tentative date to go and see some camel racing, which appears in Appleâ€™s iCal as shown in the image below. Note the format of the time stampâ€”it uses the abbr element, indicating that the content inside the opening <abbr> and closing </abbr> tags is an abbreviation of some kind. 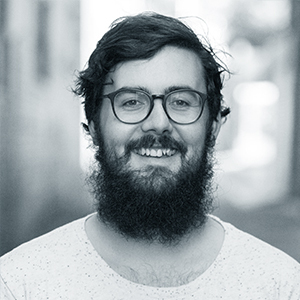 So, for humans, the easy-to-read time of 9am is displayed, but the Microformats parsers (also known as the machines) need a specific date/time stamp, which is provided in the title attribute of the abbr element, in the format YYYY-MM-DDTHH:MM, where the T is a separator between the data and time sections. Note that there are some concerns that the fact that hCalendar uses the abbr and title in this way actually makes it harder for people using assistive devices such as screen readers, as they may prefer to announce the content of the title attribute over the human-friendly contents inside the abbr element. At the time of writing, the debate about whether a solution is required for thisâ€”and what form it may takeâ€”is ongoing (for a good overview of the problem, read the posting on Webstandards.org at http://snipurl.com/hcal-access), and be aware that thereâ€™s a possibility that the format for this may change in a future iteration of the hCalendar standard. What’s the Benefit of Using hCalendar? With the way that the Webâ€™s going, and with the increasing use of online calendar services and social software that requires (or would greatly benefit from) data sharing, itâ€™s desirable to have a standard for marking up event details that can be read easily by humans, but which allows that data to be shared and ported from web application to web application, to desktop applications, and to hand-held devices. If youâ€™re in the business of publishing any event details within your web site, youâ€™d do well to consider marking them up using hCalendar formatting.